Alba is a minor league city with major league restaurants in and around it. It makes for a pleasant day of touring, and is not to be missed in autumn when the white truffle market is in full swing. Surrounding Alba is the Langhe, the wine area of Barolo, Barbaresco, Barbera and Dolcetto. As with many high-quality wine-centric villages, here you will find outstanding restaurants—formal and informal—some with stunning views, others with plush interiors, or casual settings. Here’s where I enjoyed all that and memorable dining. 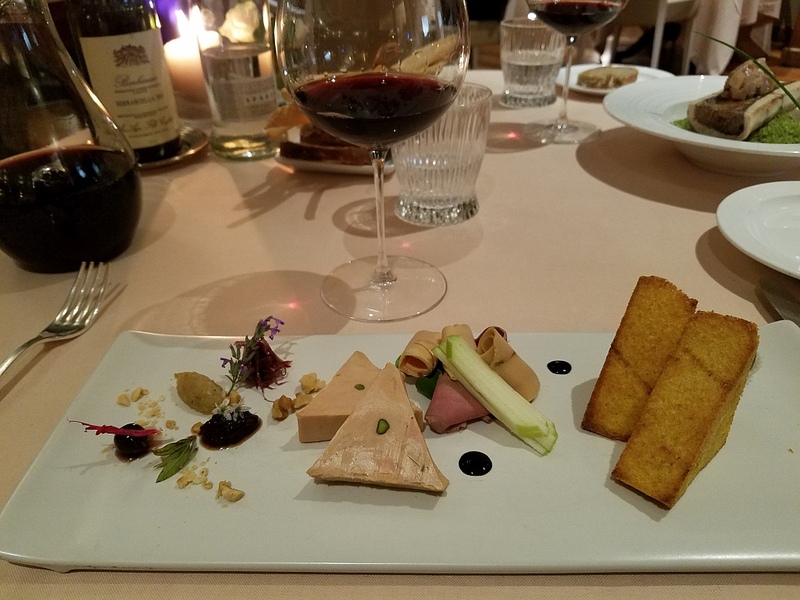 In the center of Alba is the exquisite Piazza Duomo, one of only 10 Michelin three-star restaurants in Italy, and owned by the Ceretto wine family. I started my visit to the area with lunch at Ceretto’s much-less expensive trattoria La Piola, located on the ground floor of the Piazza Duomo. Using organic foods when possible, the menu is market-driven and black-board written. The October day’s punishing rain was inhospitable to man, but a friend to the season’s white truffles. I had no intention of resisting the 35 euro offering for five grams of the white earthly diamonds shaved over perfectly cooked tagliatelle coated with butter. They added a delicious nutty aroma and taste. But a pork chop arrived overcooked alongside roasted potatoes that were only acceptable. 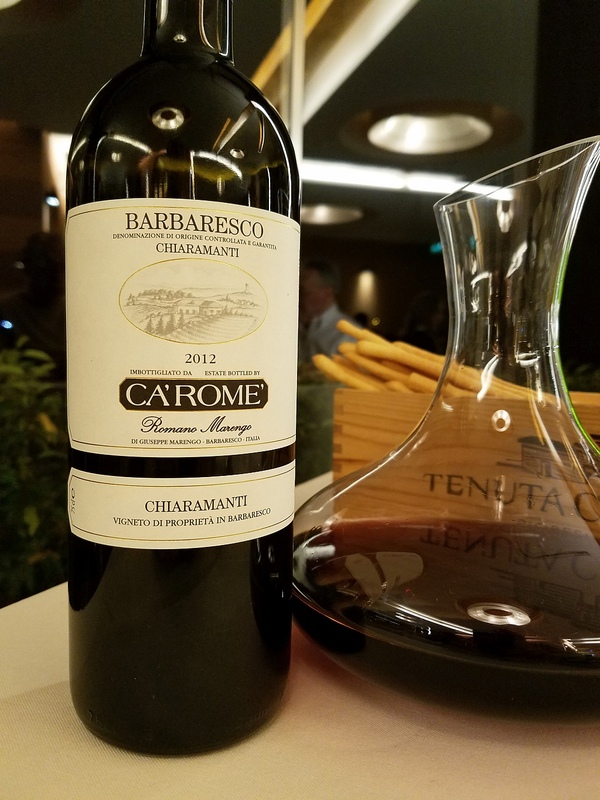 A glass of Marcalberto Franciacorta and Ceretto’s organic Bernardina Nebbiolo d’Alba were delightful choices from the expansive by-the-glass selection. The restaurant is closed on Sundays. It is widely believed that nebbiolo, the grape of Barolo and Barbaresco, gained its name from nebbia, meaning fog in Italian. In the Langhe’s valleys, fog forms and rises up the hillsides blanketing the vineyards, roads and villages. After a day of constant rain, I encountered a fog-filled night making it very dangerous to drive to my dinner reservation. But the road from my hotel Villa d’ Amelia was fog-free to Alba, where I hopped-and-skipped over and around puddles to the dining room of Osteria Era Nuova. The first surprise of this restaurant furnished with simple wooden tables and chairs was the absence of a wine list. The chef-owner wants to offer whatever pleases him, so I was told to look in the cooler for the white and sparkling wines, and on the wall shelves for reds. Prices were on the tags around the bottle’s neck. From the cooler, I pulled the nonvintage Le Marchesine Franciacorta Brut with its crisp, white fruit flavor and flora aroma. It was a friend to the appetizer of vitello tonnato. 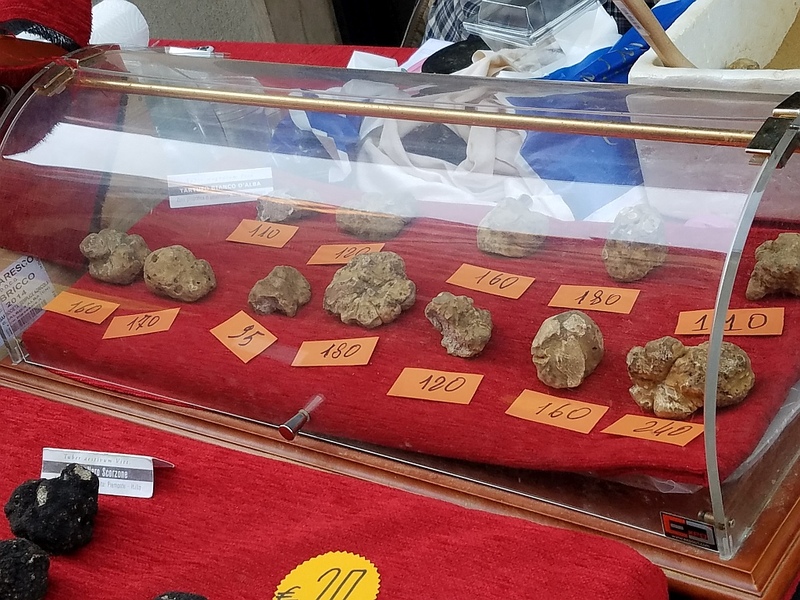 And, how could I say no to the bargain price of 4.5 euros for a gram of white truffles? So, six grams were shaved on my tagliatelle layered with a classic and tasty meat ragout. Inspecting the reds wines provided an intermezzo; I opted for the northern Italian 2014 Tiefenbrunner Pinot Noir Alto Adige over the local Dolcettos, Barberas and Barolos. Its rich, dense blackberry and vanilla taste was too New World and disconnected to the veal roasted 12 hours and served with mashed potatoes. It was a dish from the era before microwaves and when grandmothers cooked throughout the day. Having white truffles at lunch and dinner made the late night rain pounding on the car seem more musical than threating (closed on Mondays). Massimo Camia is the chef and owner of this eponymous restaurant, which, from 1990 to 2004, was known as Locanda nel Borgo Antico in Barolo. 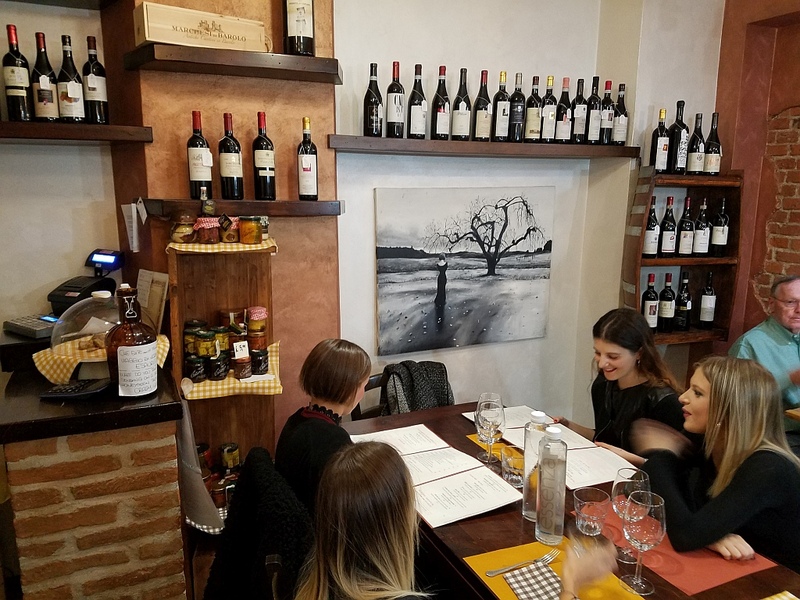 Then, Camia partnered with the Damilano winery and relocated in a new, stylish and spacious restaurant next to the winery. Here, he has maintained his Michelin one-star status. Plin is the Piedmontese word for pinch, which is what you do to the pasta when making the classic meat stuffed small agnolotti. Camia served his delicious version with a meat reduction that was as rich and seductive as any French foie gras sauce. A snow fall of shaved white truffles was added—at what I was learning was the 35 euro market price. It paired wonderfully with the 2011 Barbaresco Produttori del Barbaresco Muncagota Riserva. Little did I know that ordering the rack of lamb would cause a culture clash. 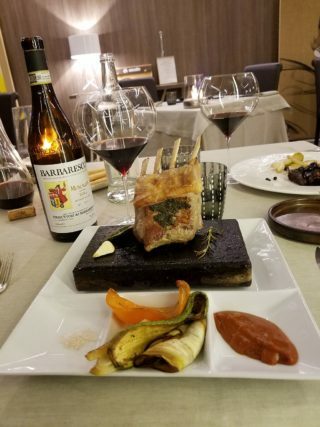 Described as cooked on a Luserna stone, I had no idea that I was going to be doing the cooking until the smoking hot stone was placed in front of me. I was instantaneously transported from Camia’s elegant dining room to a Benihana chain restaurant. Perhaps, for Italian and European guests, cooking their rack of lamb on a blazing stone is entertaining. But, for me, I object to having lamb fat spray towards me when dressed for dinner in an upscale restaurant—not to mention such a thing foregoes the cooking skills of a Michelin-star chef and his team, which was the very reason I made my reservation. My objection earned a response that this was a house specialty with the lamb remaining on the hot stone in front of me. As for the lamb itself, it was of high quality. That said, consider yourself forewarned (closed Tuesday and Wednesday for lunch). The gods were with me when the only sunny day of my trip coincided with my lunch reservation at Palas Cerequio. Sitting midway down a steep, partially paved narrow road in the middle of the Cerequio vineyard, the nine-room jewel box inn and restaurant is owned by the Chiarlo wine family. From every table there is a spectacular view across the lawn, hillside vineyard, to the castle on the top of the next hill a mile away. 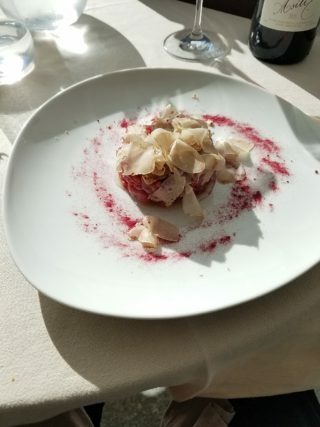 A first course of cherry-red steak tartare was dressed with—you guessed it, white truffles—and only a pinch of salt and olive oil. Not for a moment did I miss any of the traditional accompaniments of my favorite way to eat beef. Just as outstanding was a main course of meat-filled plin ragout; both dishes were perfect with the 2015 Michele Chiarlo Barbaresco Asili Cru. 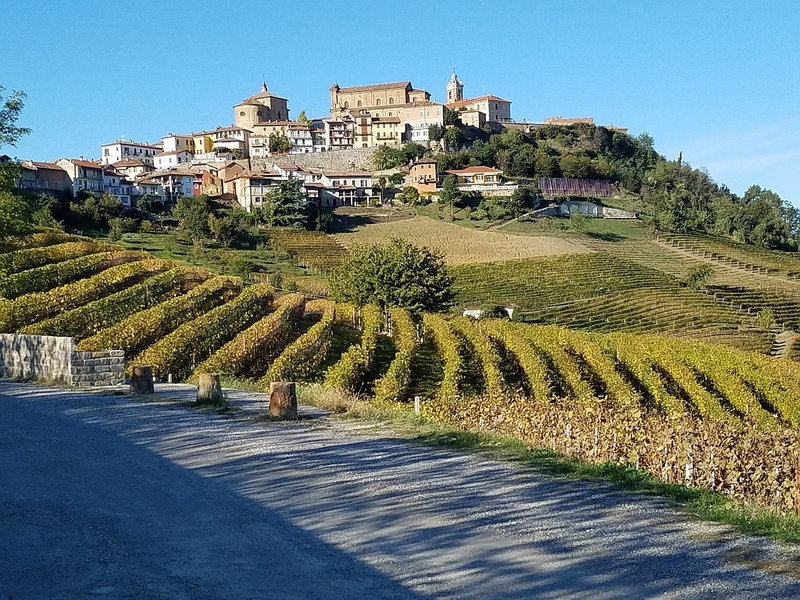 The return trip up the hill offers opportunities for Instagram-worthy photos of the ancient village of La Morra and miles of undulating hillside vineyards. On a downhill road from La Morra and a few minutes from the Renato Ratti winery in Annunziata, is the two-level Osteria Arborina where the talented chef Andrea Ribaldone was awarded a Michelin star in 2018. Downstairs is a modern-styled posh room, which, if it were in Milan, would be filled with fashionistas and models. Accessed by an outside stairway, the second floor is a more casual glass-enclosed dining room offering views of vineyards and hilltop village for miles. On my visit, the late autumn day offered a colorful vista of the leaves on the hillside vines. A first course of rabbit pate with mushrooms was of a grayish and brown palette that would not be eye-catching to any fashionista, nor was it to my palate. The main course of rabbit cacciatore was much better and doubly so with the nonvintage Monte Rossa Rose Franciacorta (closed Sunday and Monday). 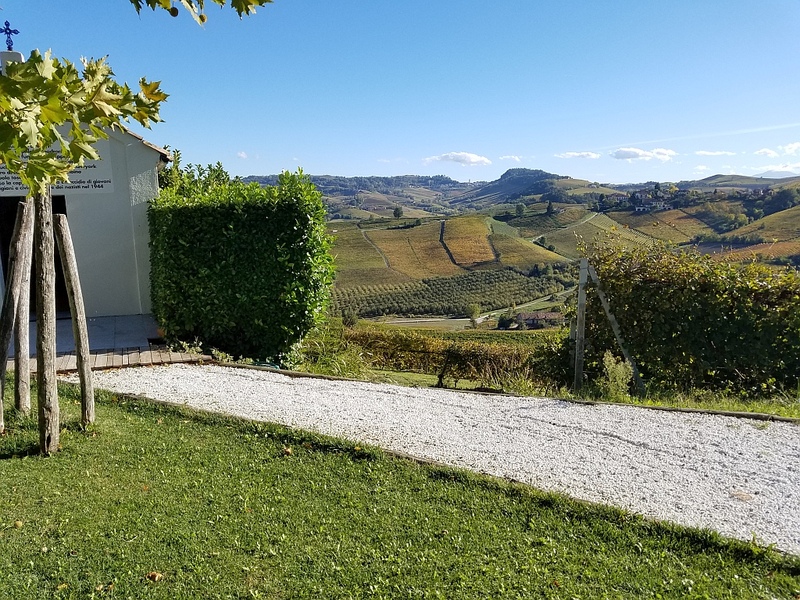 The first reservation I make when planning a trip to the Langhe is at La Ciau del Tornavento, my idea of a gourmet’s paradise. The warm welcome extends from the reservation desk to the table, which, no matter where it is, offers comfort, space, and views of the distant mountains through its floor-to-ceiling windows. The wine cellar is a treasure trove of tens of thousands of Barolos and Barbarescos, from which my sommelier (there were at least three working the floor during my recent visit) recommended the unbeknownst (to me, anyway) 2001 Cigliuti Barbaresco Serrabeollo Cru. As I sipped my way through this elegant wine, I wondered why I never heard of this producer and vowed to add it to my cellar. If my geometry teacher wanted me to understand triangles better, he should have served me perfectly formed ones made of foie gras like this chef did. Slices of smoked duck breast next to the lobes enlightened me, too, without confusing the geometry of the plate. And the second course duck plin with the butter-enriched veal sauce was everything my cardiologist told me to avoid, but what my palate demanded. Cutting through this richness was Cigliuti’s Barbaresco with its youthful tannins and raspberry flavor. How disappointing the pilgrimage would have been to this culinary cathedral if I had not had the roasted goat with a glass of 2010 Mauro Molino Barolo La Serra. The sommelier told me the wine would be the goat’s best friend, and it was, with its soft tannins and red-fruit flavor. 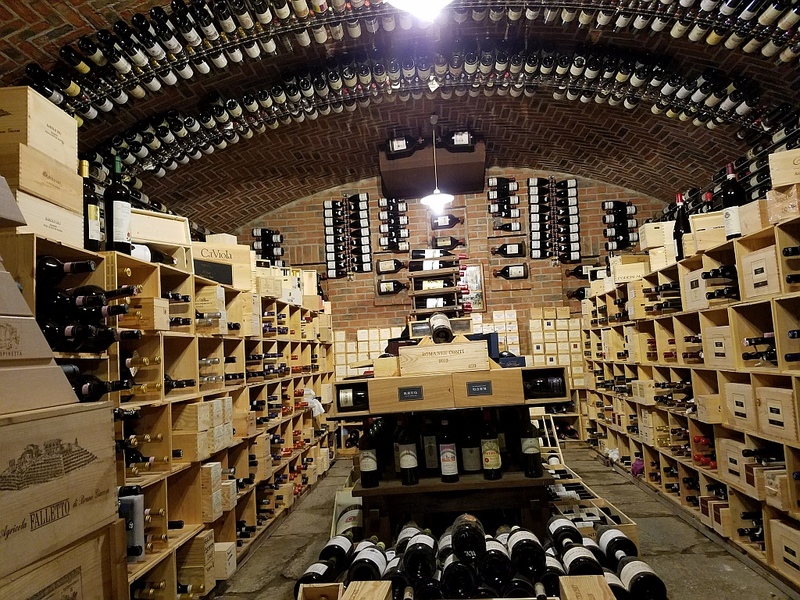 Before the goat was served, the sommelier took me to the cellar where I spent 20 minutes or so carefully moving in the rooms filled with bottles of liquid gold, epicurean desires and my own vinous lust (closed Wednesday and Thursday lunch). One of Il Ciau del Tornavento’s floor to ceiling wine rooms. In the center of Castiglione Falletto—one of the most important Barolo villages—is the casual restaurant Le Torri. For two decades, I’ve had lunch here after tasting wine at one of the many producers hugging the steep mountain top. Le Torri is the only restaurant I know of in the Langhe that offers a selection of half bottles of sparkling wines. I chose Piedmont’s Contratto Extra Brut. Labeled metodo classico, the chardonnay and pinot noir blend was aged three years. It was refreshing after my morning tasting at Ceretto, and matched well with the chef’s cheese plin covered with shavings of white truffle. the server needs a second truffle! A tasty sausage-stuffed rabbit leg was moist and filling. From my comfortable chair, the last sip of the Contratto accompanied my view of a pair of cyclers peddling up the winding road (closed Tuesdays). I had a twinge of pain driving into the Cannubi vineyard to arrive at Locanda in Cannubi, owned by the Carretta wine family. A few acres of precious Barolo soil were paved for the parking lot, and more were eliminated for the restaurant. I thought: Would not the world be better if vines were here and the parking lot and Locanda elsewhere? A glass of 2012 Ferrari Perle Brut provided a balm at the comfortable table where I read the wine list and ordered the 2012 Ca’Rome Barbaresco Chiaramanti. 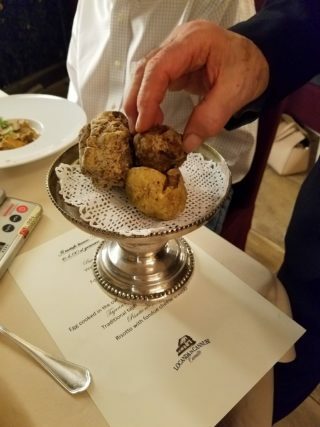 But I didn’t have to read the menu after the server brought a tray of white truffles to the table and said the chef would make a serving of butter-coated plin for them. Then, he recommended lamb chops seasoned with rosemary, which we agreed would be wonderful with the Ca’ Rome Barbaresco. 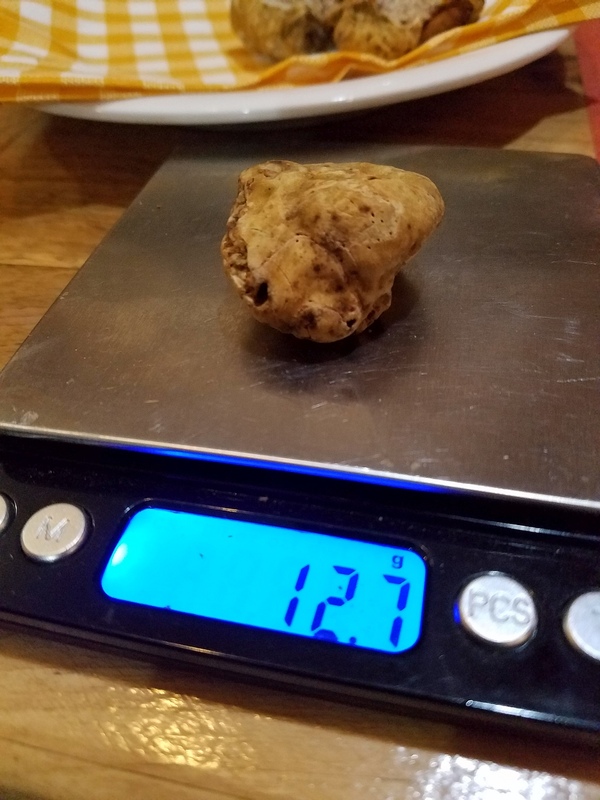 A tuxedo-clad server brought a scale and a large white truffle to the table. 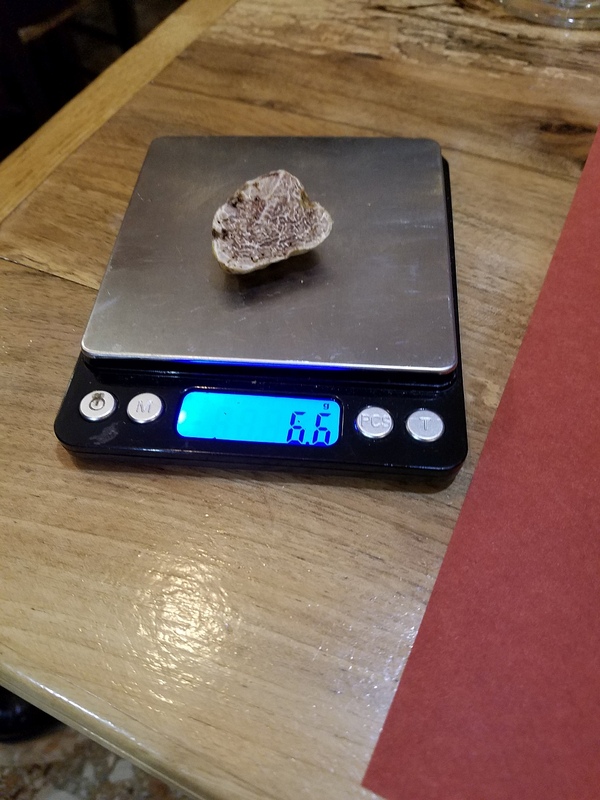 He weighed it, then started shaving it over the pasta, and when I thought enough had cover it, he put what remained on the scale. It was seven grams lighter. And I was kilograms happier. The Barbaresco was young and rambunctious. Its tannins, and rich, black-fruit and black-pepper flavors would have been too aggressive alone, but decanted and tasted with the silky lamb perfumed with rosemary made them the friendliest couple in Barolo. Throughout the trip I skipped dessert, but Locanda in Cannubi offered hazelnut gelato. I succumbed. And then forgave them for putting blacktop and concrete where vines should have been (closed Sunday dinner and Wednesday). Alba and its wine environs are ideal for a three-day trip. You’ll eat well no matter the season, but in autumn, you’ll be seduced by nature’s decision to make this area’s white truffles the world’s greatest place for dining. I loved your piece on my little corner of heaven. I’m left with a warm smile from ear to ear and a knowing audible sigh. What a great comment, thank you Jerry. Taking your cardiologist on a wine & food trip to the Langhe is the best way to change the practice of medicine!